Conforming to AS/NZS 3500.3-2015 Storm Water drainage. Dimension 'h' NCC (mm) Whats this? Dim 'h' Plumbing Code sloping gutter. Dim 'h' Plumbing Code Level gutter. If the roof sheeting has a downturn as shown, AS/NZS 3500.3:2015 allows a reduction in the allowance for surface undulations. 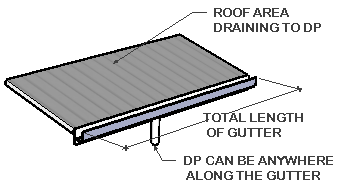 Tick if roof sheeting is turned down into the gutter. Note; Does not apply to the NCC result. Neither the National Construction Code (NCC) or the Plumbing Code agree with their stated formulas, or with each other. Where b=gutter length & Cd=0.63. This is an accepted weir formula. Q = 1.87 L/s. NCC states 1.5 L/s. Working back the other way, a flow of 1.5 L/s requires only 8.6 mm set down instead of 10mm as per the NCC. This can possibly be explained by rounding to the nearest acceptable 5mm or allowance for wave motion etc. The Plumbing Code notes referring to Table G1, state that an allowance for wave motion of 19mm and 13mm have been applied for level gutters and sloping gutters respectively. This works with the NCC formula and plumbing code table G1 for an overflow of 1 L/s/m. For example: Using the NCC formula for 1 L/s gives a setdown (h) of 6.62mm, adding the wave motion allowances of 19 and 13 give the values stated in the Code Table G1. However for an overflow of 0.2 L/s/m table G1 gives values of 18 and 12 which are both below the stated allowance for wave motion. 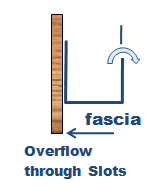 Now comparing the NCC with the Plumbing Code, the required set down values for 1.5 L/s/m overflow are 10mm and 21.6mm respectively for a sloping gutter. This is a substantial difference. However one could argue that the particular volume of the NCC (Vol2) that states this formula, relates to domestic construction, Class 1 and class 10 buildings. whereas the Plumbing Code relates to all construction. Also Vol3 of the NCC which relates to other classes of building refers back to the plumbing Code AS/NZS 3500.3. The main difference seems to be the allowance for wave motion (and construction tolerances). Is this a rock and a hard place or what? So, What have I done? and What are you supposed to do? I have added 1.5mm allowance for wave motion to the NCC result (that will at least give the same answer as theirs for the h=10mm method.) However it is best not to go below 10mm, as this is the only size the NCC gives. And it sounds reasonable to make this a minimum setdown to allow for construction tolerances, wave motion etc. Therefore this program will not go below a 10mm setdown. For the Code case, the formula only agrees with the NCC equation, and the stared allowance for wave motion at an overflow of 1 L/s/metre. It would appear that the wave motion allowance is decreasing with a flow decrease. Therefore I have modified the parameters in the formula to give the same results as table G1 in the Plumbing Code. 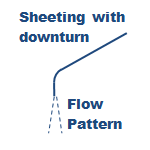 However the Code does suggest that the wave motion allowance can be reduced to between 5 and 8mm if the roof sheeting is turned down into the gutter. If you choose to do this, you can reduce the above Code 'h' by about 8mm. Turning the sheeting down in the NCC case has no effect on the setdown. You will have to choose which approach you are comfortable with. However, by using the Plumbing Code value, you will be on the safe side, and comply with both Codes. If you have a class1 or class 10 building you can use the NCC method as the NCC overrides the Plumbing Code. Clause A1.4 of the NCC Volume Three (the PCA) states that the NCC overrules in any difference arising between it and a referenced standard. 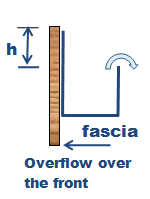 The Overflow methods over the front and back of the gutter are common to both the Plumbing Code AS/NZS 3500.3, and the National Construction Code (NCC) Vol 2 for residential structures. 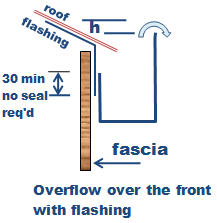 The flashing method is taken from the Plumbing Code. The NCC has other methods of overflow involving inverted nozzles, slots, small weirs, and rainwater heads. Now consider this - The eaves gutter is to be designed for 1:20 year rainfall, whereas the overflow is to be designed for 1:100 year rainfall. So, if the gutter was flowing full at Q20, it will presumably overflow at any rainfall interval greater than this. So unless the gutter suddenly acquires a steeper grade, and hence carries a greater flow, we can expect water to overflow before reaching the rain water head, overflow weirs, inverted nozzle etc. These methods may take the load off the downpipe, but I would question if they have any effect on the gutter capacity. For this reason these methods have not been included. A gutter installed with this set down from the top of the fascia, or flashing, with overflow over the front, or back of the gutter, will handle all required overflow from a 100 year ARI storm. 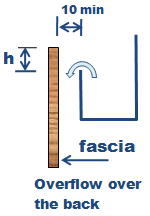 The overflow is weir flow, therefore dimension 'h' is the same for all methods.